They all take place on Saturdays from noon to 9 PM. I'm glad to see that the Portland affair is at Hopworks -- I really enjoyed the 2006 festival at the Quimby Street Lucky Lab. Last year's was way out at Edgefield, pretty much guaranteeing a car trip to get there, which always sets me off on the wrong foot. 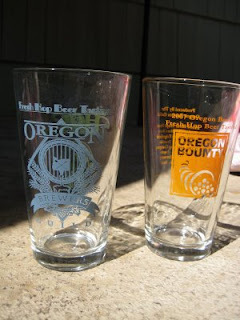 At least 8 of the advertised beers were not actually poured at the Edgefield event. The $5 souvenir glass was ratty looking. I hate the term "Tastival". Please stop using that word. The gaps in the program last year were truly breathtaking. No beers from Ninkasi, Amnesia, Standing Stone, Mia and Pia's, Raccoon Lodge, or Calapooia -- even though they had been promoted as part of the tastival -- and a couple of alternate brews from other breweries were missing also. That was a drag. You probably think it's whiny to complain about the glass, but the 2007 glass was really, really ugly compared to the one from the year before. In the picture above, 2006 is on the left, 2007 on the right. Even if the logo itself wasn't so ugly, the quality of the printing was far worse, with flaws and bubbles. It's not a big deal, but still disappointing. The good news is that this year's season has started -- Dave went and picked up growlers of Rock Bottom's harvest ale last Thursday. Both Full Sail and Bridgeport will unveil their offerings this week, on Wednesday and Friday respectively. It seems like the fresh-hop ales are coming out a little earlier in 2008 than 2007 -- my first sighting last year wasn't until September 25th. I also heard that New Old Lompoc was brewing theirs last Friday, so look for it sometime around the 19th. Rock Bottom's Hop Harvest had the right idea, a rich golden ale with a nice body. It had that fresh, green flavor that I crave in these beers, but not quite enough of it. I'll give it a "B". I'm eagerly awaiting the rest of this year's crop!